Outboards have done some growing up in the past few years, maturing from baby horsepower outputs to some real big boy power producers. In the 60s, a big outboard on our lake was a 40 hp Johnson and the really big motors were 100 hp! Years later, the introduction of the 275s and 300s was big news. 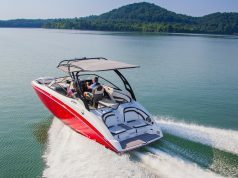 Today, Mercury’s Verado 400R and Yamaha’s F350 are considered leaders of the power pack, but harnessing some serious power are Seven Marine’s 557 and 627 horsepower outboards. 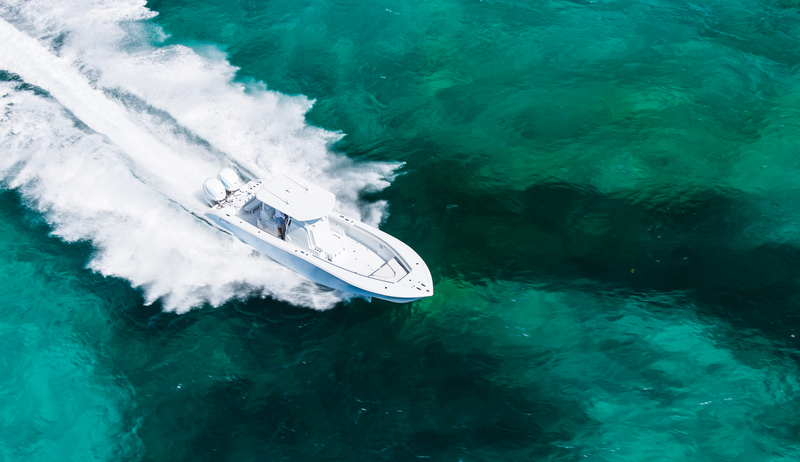 Driving the demand for more power are bigger boats. Larger centre consoles and walk around fishing machines are packing more power punch than ever. Some of the fastest centre consoles are running with quad 350s and 400s on the back. Day boats like bowriders and cuddy cabins are getting grander and larger and are ditching the stern drives and opting for outboard power. One of the producers answering the call for more muscle is Seven Marine, founded in 2010 by a team of engineers under direction of company president Rick Davis. Davis has 40 years in the marine industry and has been involved with a series of innovations including Mercury Optimax and Verado outboards. 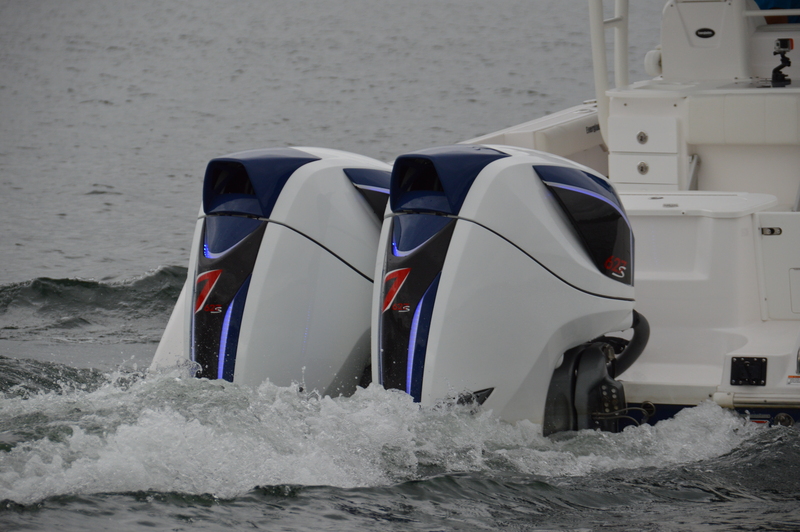 Seven Marine uses a marinized automotive engine in their outboards. 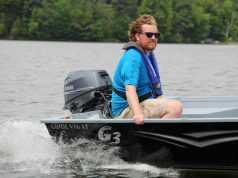 The first conception of their motors showcased the innovations for a high-tech V8 outboard in February 2011. They launched the 557 in March 2012, then the 627 at the 2015 Miami Boat Show. In developing these engines, Seven Marine partnered with several leading automotive companies including GM and ZF. They started by working with General Motors’ Powertrain OEM Sales group, sharing expertise and refining their version of a marinized small block supercharged V8. The engines are all aluminum 90 degree, 6.2 L V8’s, with a 4.065 inch x 3.622 inch bore and stroke. Modifications have been made to the combustion chambers, programming and mapping of the GM MEFI engine controller. 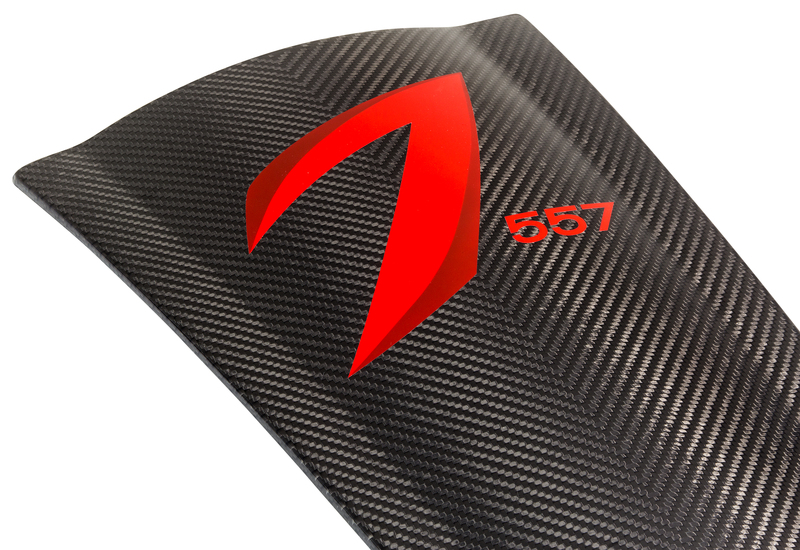 Developing their marine specific high turbulence combustion chamber technology further enabled them to boost the power of the 557 by 70 hp to 627 horsepower. And they still run on regular 89-octane fuel. It is interesting that the 527 has a compression ratio of 9.1 to one while the 627’s is 8.6 to one. The maximum rpm differs as well. The 527 tops out at 5,650 rpm and the 627 at 5,850 rpm. Both engines are multi-port fuel injected with an 8-coil digital ignition. Lubrication is a dry sump system. The cooling is a closed loop system, with twin counter rotating gear driven impellers. The pump provides water for the coolant and oil heat exchangers, ensuring corrosion protection and thermal efficiency. To produce lots of power from a small block V8 requires large volumes of air in and out. 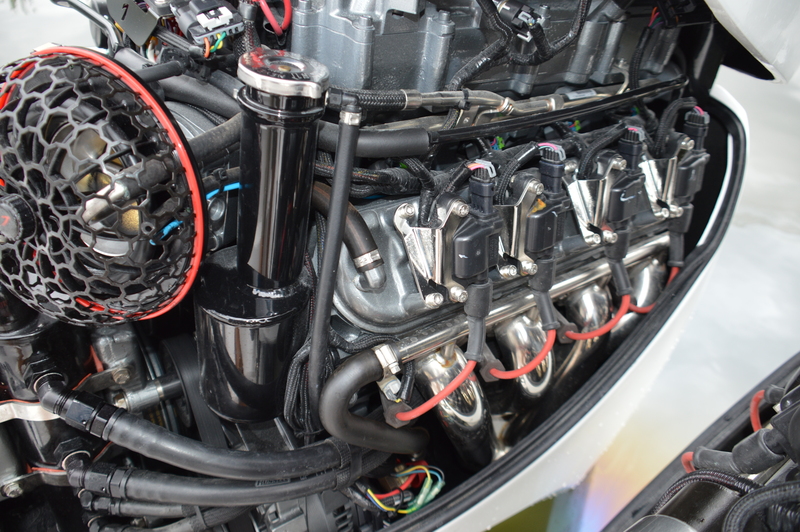 Seven Marine employs a 1.9L TVS based supercharger with intercooler for this task. Gear driven by the engine, the supercharger does not lag like an exhaust driven turbocharger. To get the air (exhaust) out, the engines have dual stainless steel tubular headers. 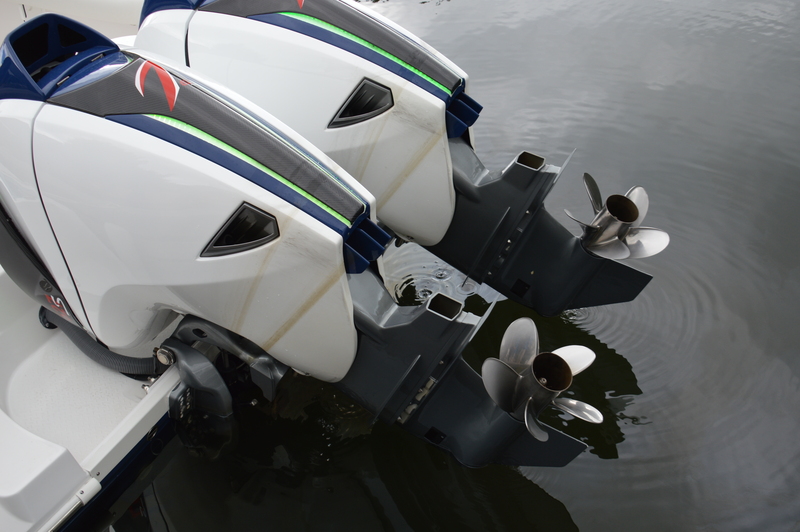 The dual 3.5-inch pipes flow through the propeller hub and at idle the system has twin overboard bypasses in the mid-case. To keep things cool under the cowl and in the mid-case the headers are jacketed and water injected. The packaging and how the power is delivered to the propeller is as innovative as the power itself. First the engine is mounted horizontally versus the typical vertical positioning. This required the development of a gear set to take the power from the crankshaft and transfer it vertically beneath the engine. 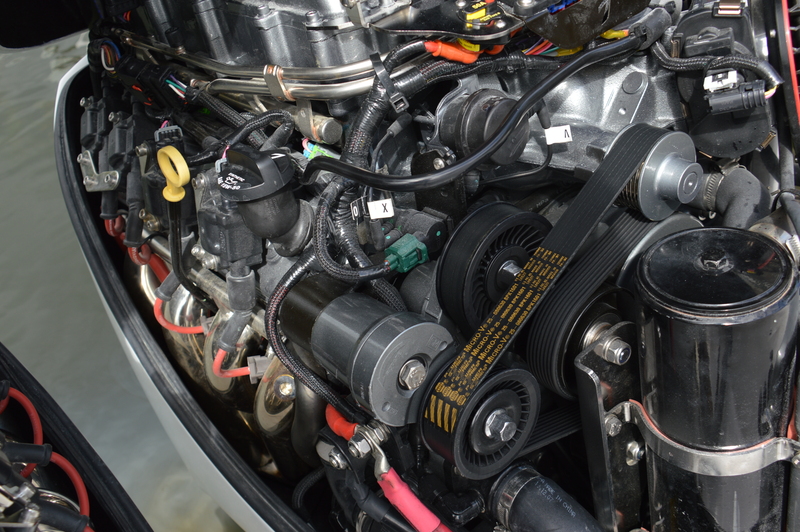 Lightweight helix gears are employed to fit the space confines at the rear of the engine. This position allows access so the gear ratios can be changed depending on the boat application. Working with ZF Marine, a transmission was developed for the Seven Marine outboard. From the onset of the project, the use of DTS and joystick controls was mandated. With accurate computer control, the transmission utilizes five disk electro-hydraulic clutches for precise, rapid smooth shifts. The transmission also redirects the power 90 degrees downwards. From the transmission, power is transferred via a single shaft to the gear case. 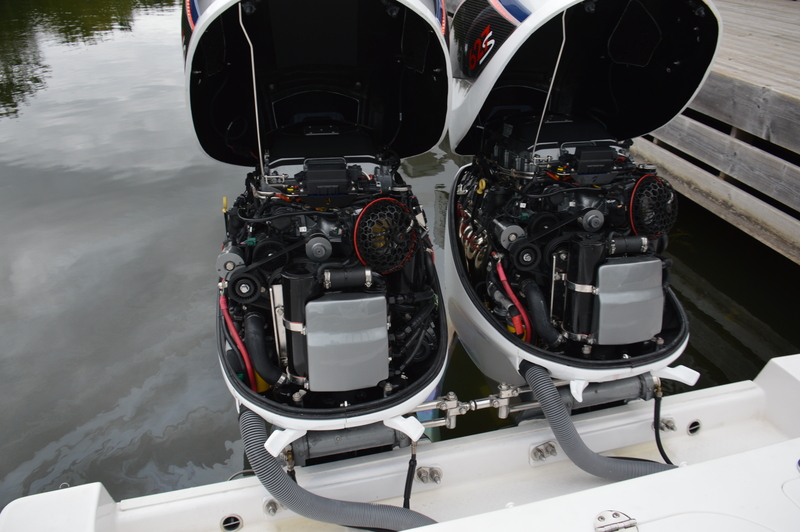 Unlike traditional outboard or sterndrive gear cases that include transmission components, the Seven Marine unit only transfers power to the prop shaft. This reduction in internal components allows for twin pinion gear sets to relieve the load and stress from a single pinion set. It also allows for a more streamlined efficient case. 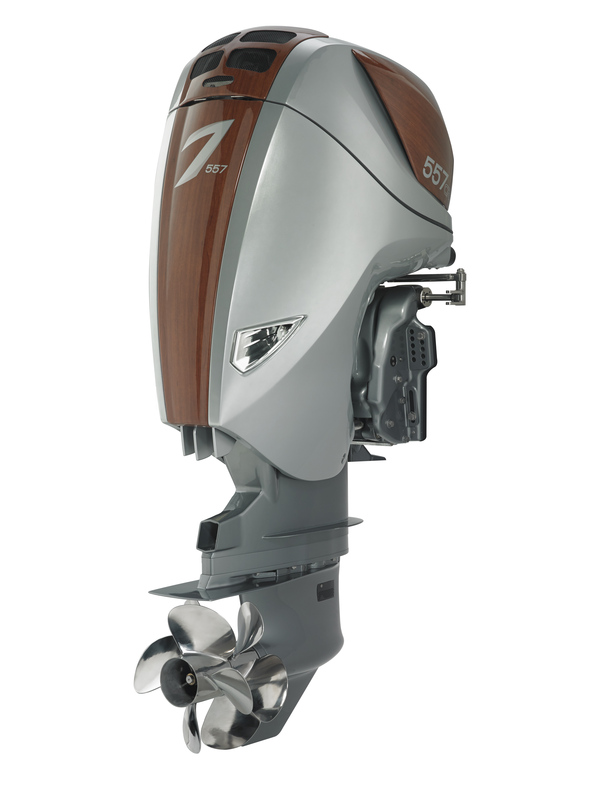 With all of this innovative engineering coming together, the appearance of the outboard is slick and bold. Care has been taken with every line, angle and plane of the cowling and mid-case. The result is impressive. Most importantly, it makes the total package look smaller that its actual dimensions. The use of custom colours allows owners and boat manufacturers to go for a look of their choice. With the introduction of the 627 and the new spectra-blade cowl, programmable LED lighting, a range of panel inserts and custom colours and textures, like carbon fibre, set the motors apart from any others on the water. On water performance is what this effort is all about. We tested the new 627s on a new Everglades 355 CC. 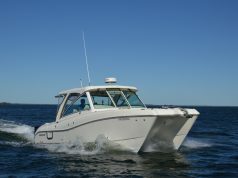 It was the first of these boats to be powered by Seven Marine in Canada. Dockside the 627s fire up with a distinct V8 bark and rumble through the overboard exhaust ports. As the headers fill with water, they settle down to a low grumble and are surprisingly quiet. Using the DTS controls to manoeuvre away from the dock and out of the marina confirmed the precision and quiet shifts we were told to expect. With integrated hydraulic steering, digital control steering only required a light touch. In open water, hitting the throttles was exhilarating. 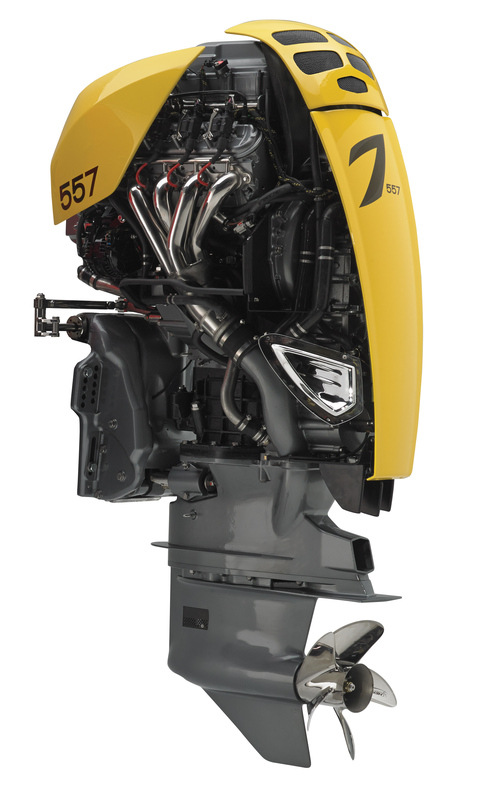 The 627s’ prop shaft horsepower and 600-plus foot-pounds of torque delivers. Not to mention that sound! It’s a distinct V8 pulse with an over riding layer of supercharger. It’s not overly loud, just present. As for the numbers, they’re impressive as well. The combination topped out at 63 mph and could cruise efficiently at 30 mph at 3,000 rpm. Zero to 20 mph, planing speed came up in 4.5 seconds and 30 in 7.15. Where the 627s really shine are in the mid range with sprints from 30 to 40 mph in 3.8 seconds and 40 to 50 in 5.2.